Sometimes, it’s not about what you say but how you say it that matters. Truer words have never been spoken, especially when it comes to email signatures. When you correspond with people through email, leaving a good impression is important. 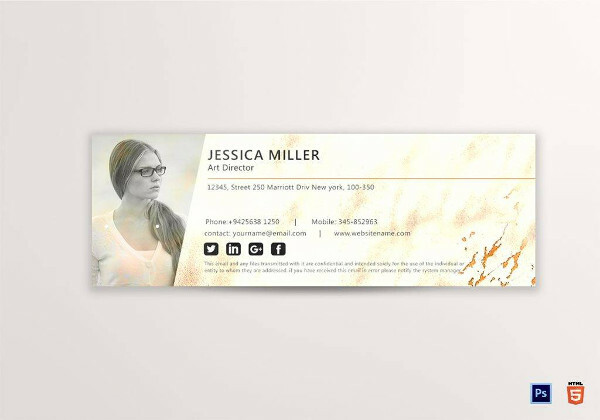 This is an opportunity for you to present yourself in such a way that recipients will remember you for, so it wouldn’t hurt to put on some extra effort with your email signature design. So in this article, let’s find out how a good email signature can help, or even hurt, your marketing efforts. How different is a traditional email signature from a modern email signature? However, times have changed, and these days, it’s all about branding yourself in such a way that sets you apart from leading competitors. 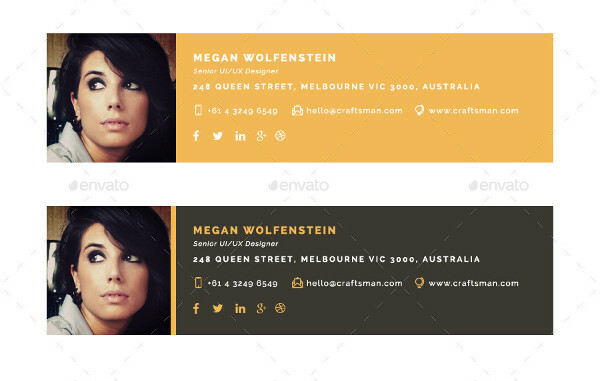 Modern email signatures usually go beyond the textual elements of a standard email signature. Some are made colorful, others might even carry short animations and GIFs to capture a person’s attention. But in most cases, you’re likely to encounter a modern email signature that’s highly responsive. It could contain buttons and links to the owner’s website, social media pages, or portfolio.You may also see company email signature examples. If you think about it, an email signature is no different from a business card. 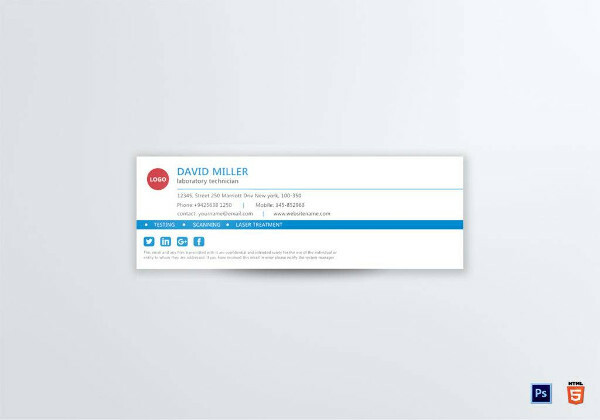 Though it may not come in the form of an actual card, an email signature shares the same characteristics as an average business card. This way, you can introduce yourself to prospects, associates, or colleagues in such a way that they can remember you for. It is defined to be your “silent salesperson,” considering how it can promote your brand and services so effortlessly that you don’t have to force anything. To put it simply: this is your name. Your email signature should contain your full name. Though it can contain your nickname to make it easier for people to recognize, especially when your real name is too uncommon and complicated for one to remember, including your complete name is vital for professional reasons. Make sure to indicate this clearly on your email signature (with the right spelling, of course) for recipients to refer to just in case they have any concerns that they’d want to report to you directly or to the company’s management itself.You may also see creative email signature examples. One of the advantages of an email signature is that it allows you to showcase your brand through your company name and logo design. This builds a sense of familiarity among recipients, and if they aren’t quite familiar about the brand being represented, it’s likely they’ll grow curious about it and would want to know more. It also puts the brand in a good light, especially if you can provide recipients with the type of service they’re looking for. What role do you play in the company? Are you the right person to contact whenever a person is in need of a particular service? Your job title should provide further information about who you are and what you do. It can say anything from Assistant Manager to Interior Design Director, as long as it clearly states your position in the company. 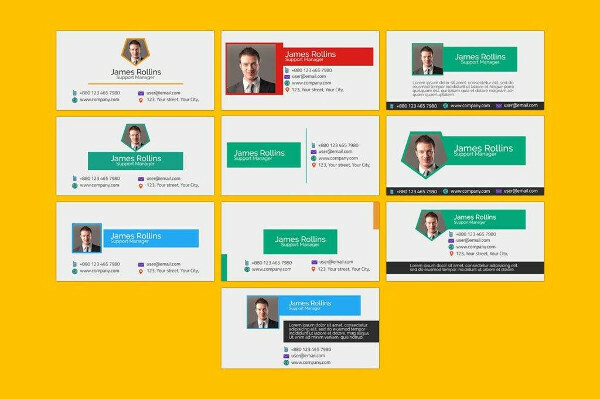 This will serve as a guide for people to know whether they’re talking to the right person or not.You may also check out here printable corporate email signature designs & examples. There are times when it can be hard to contact people through email, especially when they’re out of town or on leave, or aren’t the type to check on their inboxes ever so often. This is why it’s important to provide another means of contact for people to refer to. This is can be a telephone number, a mobile number, a fax number, an alternate email address, or even a postal address. You have to make sure that your contact details are updated as needed for everyone’s convenience. After all, you wouldn’t want people to go through the hassle of contacting you all because you failed to check your email for the day.You may also check out here sales manager email signature examples. The great thing about an email signature is that it allows you to market your brand with the least amount of effort. Say for instance, you’re trying to make a pitch with a prospective client. While you continue to correspond with one another, they may want to know more about you and your services through a more credible source. This is how you can gain a prospect’s trust. Including your website URL or any links to your social pages is one way to feed into their curiosity and to show them what you’re capable of. You may also see college email signature examples. Despite the popularity of social media and instant messaging, email is still considered to be one of the most efficient and effective communication methods by professionals around the world. So it comes as no surprise why people continue to choose email as an ideal platform to do business. A professional email signature must contain the following features: your full name, position at the company, business logo, office address, contact information, URL to your company’s website and other similar links, as well as your social media buttons. Make sure to use a bigger or bold text to highlight your name. Some professionals even add a portrait photo of themselves to create a face behind the screen, but this is completely optional. Using your company tagline might also be necessary to build recognition. 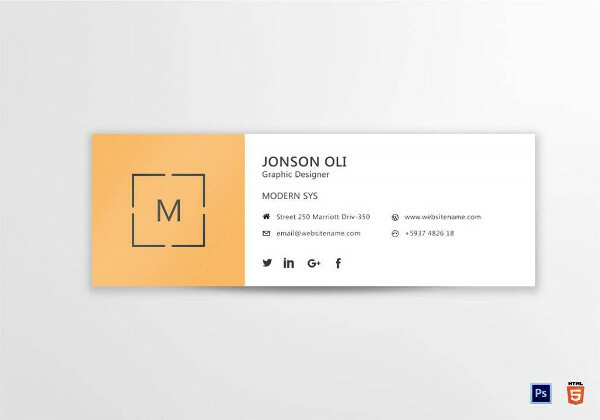 Amidst the existence of digital magazines and web banners, it wouldn’t hurt to take on a more modern approach with your email signature design. 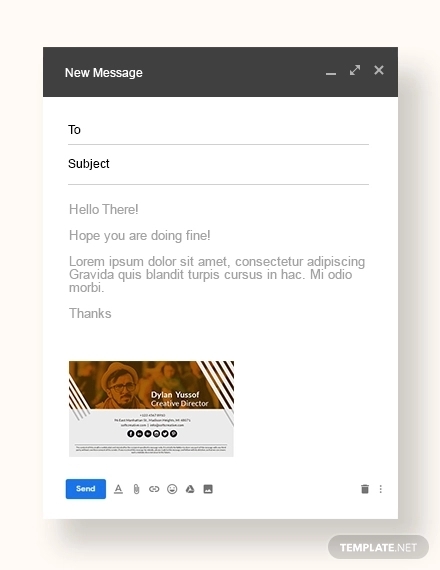 An HTML email signature is a common example of an interactive and responsive design that allows users to link their websites and social pages to the email signature. By doing so, you can make it easier for people to visit your links with a simple click of a button. However, you have to make sure that your links are updated regularly, as you wouldn’t want to redirect people to a blank page.You may also see business email signature examples. 3. Use a uniform email signature. If you’re working alongside individuals who also use signatures at the end of their emails, it’s best to optimize on a company email signature template for uniformity reasons. Building a sense of consistency across your network of employees will make the company establish credibility and professionalism. 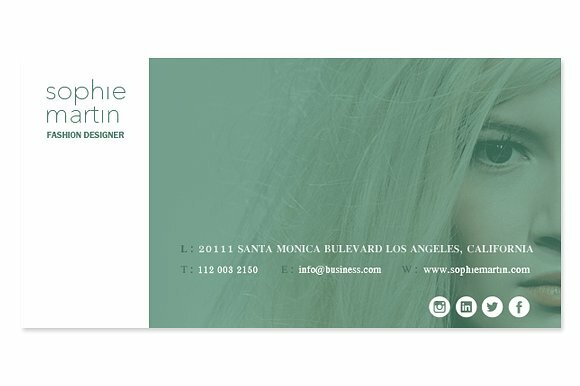 You can add a unique touch for yours, but still utilize the same background, colors, and font for branding purposes.You may also see training email signature designs. 4. Avoid promoting too much. The great thing about email signatures is that they allow subtle marketing, so you wouldn’t want to strip this away from your design. 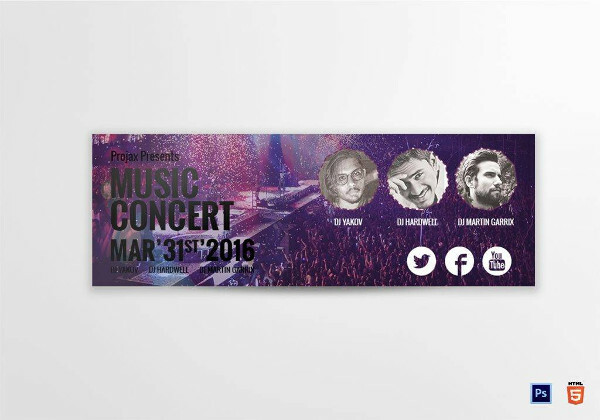 Avoid turning your email signature into an advertisement, you have web banners to do that. Instead, focus on making a design that promotes your services, without being too forceful. It should be enough to tell a person about who you are and what you do, without making it seem like a sales pitch.You may also see web developer email signatures examples. 5. Include a disclosure agreement if necessary. When it comes to email signatures and other forms of online communication, some countries have strict policies regarding user privacy. In places like the Netherlands, it is recommended to include a legal statement at the end of the email signature which consists of your company name, registration number, a disclaimer, and other similar details. You might want to do this to avoid any trouble.You may also see human resource email signature designs. Additionally, as you much as you want to create an email signature that would stand out, always remember that simplicity will never go out of style. You don’t want to overwhelm recipients with a cluttered and flashy design, as this would only make it seem tacky and unprofessional. 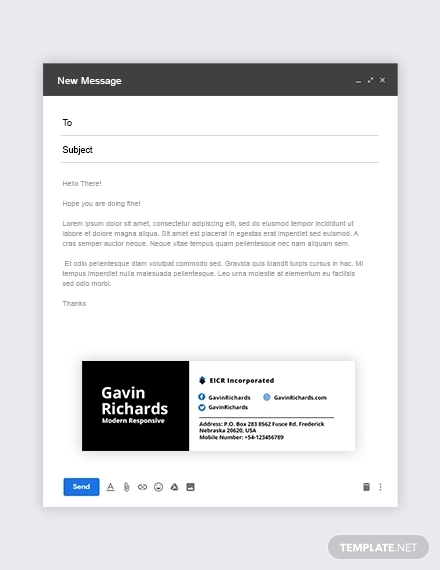 So instead, focus on the value of simplicity when crafting your email signature design.You may also see business manager email signature examples. And there you have it! Email signatures serve as the perfect marketing tool to establish your online presence with every message sent. With the help of these guidelines and examples, you’re sure to impress recipients with an email signature that’s worth remembering. 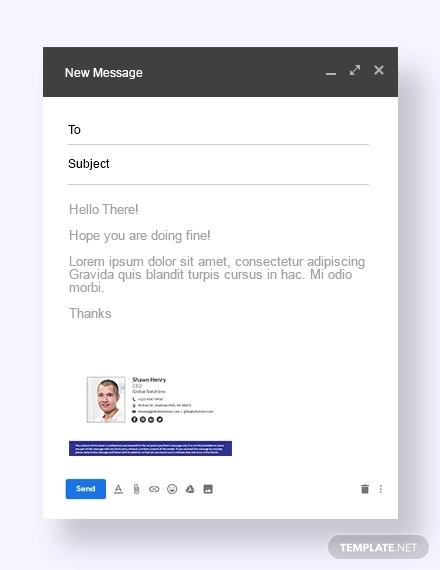 You may also see tech startup email signature designs.